Ajanta Soya limited is in portfolio of Subramanian P. He is one of the top investors in India. As per the Company website it is engaged in the primary business of manufacturing of Vanaspati and various kinds of cooking oil with shortening products for bakery like biscuits, puffs, pastries and other applications. The company went public in year 1993 just one year after its incorporation. It operates under below brand names. Brand names will help you identify the company better. The company is mainly present in Northern India and parts of Eastern and Western India. It covers whole of North India. In East India it is present only in Assam and in West India it is present in Maharastra. The company has manufacturing plant at Bhiwandi Industrial town near New Delhi.Over the years it has expanded its foot print into different business verticals. Below is stock price performance of the Company over a period of time.This will give you an indication of Company performance over the years. Note stock price is reflection of Company state at any point of time (Read Dow theory). In year 2002 the company was trading at price of 3. Over the next few years it slowly climbed up the ladder. If you see from 2002 to 2012 it touched the 20 marks three times giving investors 6 fold return from levels of 2002. Note there was global crisis in year 2008 as well. The fourth time it touched 20 odd mark in year 2015. After one year it again touched that mark and marched past it to levels of 80 on shoulders of bullish run Indian market had during the time. In year 2018 the correction left it at 20 odd levels. Still on these levels company has given 7 fold return to investors invested in year 2002. This penny stock is excellent example of consolidation and positive return over the years. 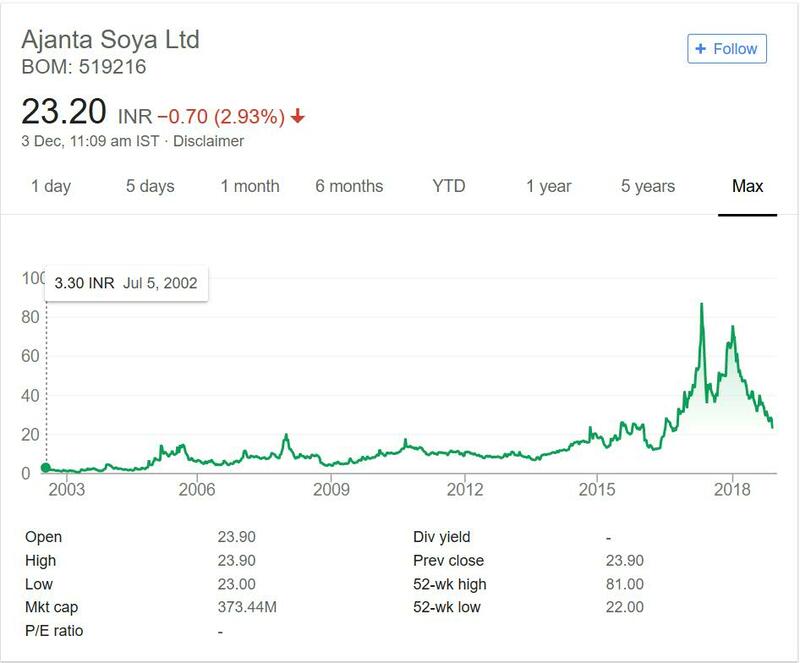 Ajanta Soya Limited has performed decently on Stock Exchanges.It has given positive returns over the years. The business vertical of Vanaspati Oil, Cooking Oil and Bakery falls under consumption theme. Ajanta Soya is present mainly in North India as of now. With time it can expand its foot print in other areas as well. The items is prepares will continue to grow with time. Consumption of Vanaspati Oil and Bakery products will penetrate in Rural India as well as Urban India. I am bullish on consumption theme based on food items. The reason is simple. The growing population and income of Indian will help these sectors grow in future. The company having presence in this sector will get benefited. Ajanta Soya has presence in North India which will see population and income growth both in coming years. This will trigger positive growth. You can add the company to your stock watch list. It will be interesting to track and company and have close eye on how it performs over the years. I will review yet another promising penny stock present in portfolio of eminent investor.